The downside to much of Zion National Park‘s beautiful scenery is the crowd—you’re not the only person who wants to explore the trails and snap a bunch of photos. A summer weekend in Zion Canyon, in particular, can be frustrating if you’re one of those who prefer the great outdoors with a side of solitude. If that’s the case, simply head to the northwest corner of the park and visit the Kolob Canyons. Almost completely distinct from the rest of the park, the Kolob Canyons sit at a much higher elevation and cannot even be accessed by the same roads that connect Zion’s other main points of interest. Its 30,000 acres feature red sandstone mountain peaks and the world’s second-longest natural arch. It’s a wilderness area with much fewer visitors than the canyons to the southeast, and the park likes it that way—parties of more than 12 persons are even prohibited from walking the Taylor Creek Trail. Every visit begins at the Kolob Canyons Visitor Center, where you can get permits for backpacking campsites and difficult canyons. The 5-mile Kolob Canyons Scenic Drive features multiple overlooks and terminates in a picnicking area, allowing you to simply stop by for some quick afternoon sightseeing and a wilderness lunch. If you have rappelling skills and enjoy canyoneering you could explore Kolob’s five “finger canyons,” or instead just hike one of the three main trails. The shortest one is the Timber Creek Overlook Trail, a good half-hour walk that ends in an amazing view. The Taylor Creek Trail winds past two historic pioneer homesteads to the Double Arch Alcove, an almost-cave in the sandstone cliffs that’s lit up in surreal colors by the afternoon sun. The third trail is by far the most challenging, but it is also easily the most rewarding. The La Verkin Creek Trail follows its namesake, taking hikers past some of Zion National Park’s most colorful cliffs, carved by the flowing water. Hikers are somewhat rare here, so the animal life is abundant—there’s a good chance you’ll come across a wide range of wildlife along the trail. There are numerous excellent lookouts to be found along the La Verkin Creek, providing some beautiful views of the Kolob Terrace, Zion’s high plateau country. 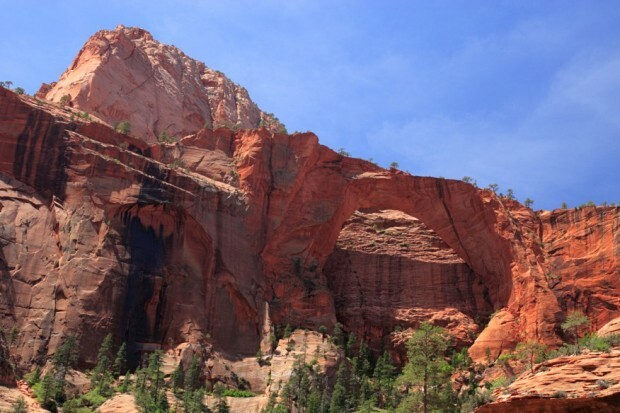 But it’s what you’ll find at the end of a little side trail halfway along the hike is this path’s biggest draw—the majestic Kolob Arch. It’s hard to get close to it, given the rough terrain, but even from a distance Kolob Arch is a sight to behold. The world’s second-longest natural stone arch, Kolob Arch’s 287 feet are just barely surpassed only by the slender Landscape Arch in Arches National Park. Stone arches are formed by the work of erosion on fissures in the rock, and the Navajo Sandstone Formation, a geological formation in which much of Zion National Park participates, is particularly prone to arch formation. Once an arch is formed, however, erosion keeps on working. Thousands of years from now Kolob Arch will take the #1 spot, as the very forces that created Landscape Arch ultimately destroy it. If you want to turn a strenuous day hike into an overnight backpacking trip, you can follow the La Verkin Creek Trail past the Kolob Arch spur almost to the creek’s source, or turn onto the Hop Valley Trail heading south—which you can follow onto Connector Trail, Wildcat Canyon Trail, and finally West Rim Trail, all the way across the park to Zion Canyon.